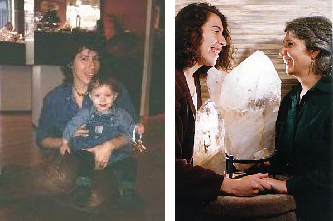 How We Began – Crystalworks Designs Ltd.
As far back as I can remember, rock hounding was a big part of our family’s adventures. One of the most enduring memories I have as a child is trudging through mud and dirt piles in abandoned mine sites looking through the tailing to find garnets and amethyst. We collected fossil on the Gaspe Peninsula, where the shells were so plentiful that we couldn’t pick them all up our pockets already bulging with our prizes. We gathered agates on the beach and colourful shale from the roadside. My father was always encouraging us but made us return stones he felt were too large to schlep home in the Volkswagen. I always believed that my stones had some kind of magic in them. How else could they form such perfect shapes and vibrant colours? When I was fifteen, I purchased some Arkansas quartz at a flea market in San Francisco. I spent the rest of the day with a good friend roaming the city with the stones in a pouch on my belt. By dinnertime I was jittery and light headed. I asked my friend if he could think of any reason why I was feeling so strange. He asked what was in the pouch at my hip. When I showed him he told me that quartz crystals are reputed to have the ability to focus and amplify energy and perhaps I was feeling the effects. I removed the pouch and immediately felt better. I went back to the flea market and purchased more. When I returned to Vancouver I showed my friends and told them my story and they wanted some stones for themselves. I decided that I needed to find a direct source of these stones. About two weeks later a friend of a friend called me and offered me a contact name in Arkansas. I called and ordered my first hundred dollars worth of quartz jewellery points. I took a silver smithing course and started to make pendants that I sold to friends and through Banyen Books. I registered the name Crystalworks in 1981. 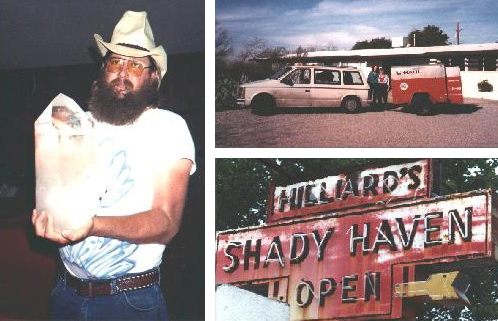 Little did I know that more than thirty years later I would be co-owner of a mineral gallery with the very same name. It had only been a dream. In 1985 I decided I wanted to take this hobby one step further so I invited my mother, Susan to come to Arkansas with me to view the mines first hand and buy crystals. I asked my father for an Air miles ticket and he suggested that I do some market research first. I went to jewellers, sculptors and metaphysical bookstores to gather interest. I found out that there was indeed a demand and so he gave us tickets. With my father as a co-signer we arranged a small loan of $2,500. We traveled on a shoestring budget. We camped, cooked all our own food and scrimped in every way imaginable. On this first trip we had the good fortune of meeting Jimmy Coleman, an Arkansas miner, who became our crystal mentor. On the return, we were bumped off an overbooked flight on the way home and fortunately secured our tickets for our next trip. We sold out within two weeks and hastily made reservations to return. This time we splurged and bought air mattresses. 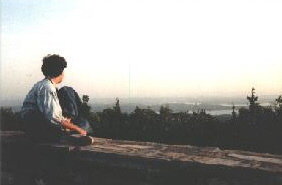 Susan and I traveled to Arkansas six times in the first year. We booked our flights during the busiest times and were the first to offer to get off the plane. We stopped camping after a particularly hair raising event. We had borrowed a friends bubble tent and we couldn’t nail in the pegs as the record 114-degree heat had baked the ground into stone. One evening, the two week long heat wave broke in the middle of the night. The winds howled, the thunder and lightning was tremendous and the rain came pouring down. We spent the night holding up the front of the tent as the winds were threatening to lift it off the ground. Susan was calling out for the ranger (who was sleeping snugly in his trailer). I was having visions of Oz. When we awoke hours later we were sleeping in two inches of water. Everything was soaked. The people at the motel up the road took pity on us and let us use their dryer. We were so grateful. Susan and I had many incredible adventures together in the first couple of years and we serendipitously met many of the people we are still doing business with today. For the first five years we didn’t take a salary. I worked a ‘real job’ to get by. Susan and I put everything we earned back into the stones and we gradually built up our collection and our contacts. By 1990 the company had out grown beyond the family home. We set off to find the perfect gallery space. I made a list of our requirements and on the very first day of our search we discovered that a heritage house that we had always admired on Burrard street had a for lease by owner sign in the window. When I walked up the stairs and saw the address number, 1800 (a very auspicious set of numbers for a business), I felt goose bumps. When we entered the place for the first time we knew it was right. It matched my list in a most uncanny manner. Over the next three months we renovated it to suit our needs. We discovered that the hundred year old building was originally a brothel run by women and felt happy knowing that again it was housing a female run establishment. The banks did not agree and without my fathers continued support, and his signature, the gallery would not have happened. Our first show entitled Images of Time – Natural Crystals and Bonsai, brought many new faces into our gallery. It garnered raves from our dedicated clientele and was the start of something wonderful. We have had many interesting and unusual shows in the gallery since our inception. We always incorporated our crystals, minerals, fossils and stones. Our intention was that people start to accept the idea of ‘Minerals as Art. We have an ever growing mailing list and several shows and sales a year. Now almost thirty years later, we are happily still in business. It feels like yesterday we were just starting out. Our space has grown and changed. Our displays have evolved and we are continuing to professionalize ourselves although people still feel comfortable and relaxed as they did when our business was still in the home. We are a family run business and proud of it. My mother Susan and I became the best of friends running the store and traveling together. More recently, my sister Andrea became involved and has taken on a greater role as a third partner. Her dedication and hard work have become an integral part of the gallery’s day to day operations. I have raised two of my children in the gallery and my son and daughter are now young adults. Before he passed, my father Morley used to come on buying trips whenever possible and helped us to expand our collection by investing in the most phenomenal pieces. In some ways this gallery is part of his legacy, as it would not exist without his support and faith in us over the years. As a women run business we have made a success of ourselves in a largely male dominated field. We are known as ‘the girls’ by many miners and mineral dealers. We all enjoy working together in the gallery and have over the years established our place in the community. Our greatest joy is to be able to sell these natural works of art to our appreciative clientele. People who enter the gallery say that it is like visiting a sacred space. What a joy it is to be able to share this dream with others. This journey really began in 1967. We lived on the east coast in Connecticut. Karen was about two years old when we started rock hounding. I think that was my first realization that the small child on her daddy’s back had something akin to “super eyes”. She could spot a sliver of mica from the height of six feet. Karen spent her child hood with her family and family dogs, equipped with a mineral pick and other prying and shovelling implements looking for pretty stones, amethyst and horn blend from Thunder Bay, mica, fossils and the occasional finds of sea glass. We all still have our original collections. I would say that that was the start of Crystalworks! Sometime around 1982, Karen approached her dad and me with the idea of starting a business selling crystals. After a bit of market research that her dad required he agreed to co-sign a loan for $2500, and to give us two bonus tickets on United Airlines to the crystal mines in Arkansas. To set the scene for this part of the tale: I married Morley Lipsett in 1961, right after my junior year in college. I had my first child ten months later. I had led a sheltered life and until this time, I had never done anything on my own. So when the car I had reserved for us in Little Rock Arkansas actually showed up… I was astounded. It was not surprising that the first night of our journey was a harrowing experience. We landed in Little Rock about 9pm. The taxi driver drove for ages and finally dropped us at our hotel which was about five minutes from the airport we had left an hour before. By this time it was late at night and we were ushered to our creepy hotel room by a rough looking man with a gun on his hip and a pinky finger where his thumb was supposed to be. It was an impactful beginning. But that was the start of our journey. The first trip to Arkansas was a frugal experience. We had a tent and sleeping bags. We snatched two sets of forks, knives and spoons from the airplane… so we had our cutlery. We stopped and argued over what size box of band aids to buy. The ground at the campground was hard and festooned with large stones. The first night, after the fiasco of putting up the tent, proved that we did indeed, need air mattresses. We bought the cheapest ones available only to have the baffles pop and the bags flat and airless in the morning. We learned many lessons on our virgin buying trip. We camped in Arkansas at Denby Point for two years. We confronted chiggers, huge spiders, black snakes, food that got wet and wouldn’t ever dry out, (manna bread, once wet will never dry… no matter what you do it), air mattresses that popped in the night, sliced fingers and a trip the doctor in Mt. Ida, (imagine), all sorts of unusual insect bites, fires that wouldn’t start, heat waves, amazing lightning shows, near hurricanes and tornados and the sound of cicadas that reached an ear blasting crescendo a 2:30 am and then stopped all at once into silence. The last time we stayed in the tent was in the summer of ‘84. It was a heat wave… 114 degrees F. in the shade and dry as a bone. We couldn’t hammer our tent pegs because the ground was like cement. During the night the heat wave broke. The wind started to howl and the rain started to come down in a manner not seen since Noah. We held the tent up from the inside and watched as it filled up with water. I called and called for the park ranger, who Karen advised me was tucked up in his warm dry bed. We fell asleep in the early morning hours and woke up soaked but grateful we hadn’t been blown off the bluff. After drying ourselves out with the help of the laundry in a friendly hotel, we gave up camping. Those years and those dozens of trips to Arkansas spent in a tent in Denby Point were memories that are precious beyond measure. It was during that time we met the miners that were to be our mentors. We learned that it was possible for minerals to be seen as “art” for the home, office and corporations. We met many of the people that are solidly in our lives to this day and we have witnessed us all age together. I can’t express how grateful I am to have shared this experience with my daughter. It has been more wonderful than I can possibly express. And to see how it has all panned out, to see the amazingly creative and delightful person that Karen has become from the time she sat in the back pack on her daddy’s back, pointing and squealing with excitement at the mica on the ground somewhere in Connecticut, to the gallery we have today, is certainly something close to divine. Now our little business has grown from a corner of the den in our home to become one of the finest mineral gallery’s in the world. The family involvement has expanded to include my youngest daughter Andrea, who has become a vital and indispensable addition to our company. We are also fortunate to have my son’s wife Sarah as a valuable member of our team. She brings a business expertise and has added a degree of professionalism in our office for which we are grateful. It would have been beyond my wildest expectations or dreams in 1967 that our family outings would evolve into the Crystalworks Gallery at 1760 West Third Avenue. I am blessed beyond measure to be working in such a beautiful space with my family.